Opening this past Monday in Kentucky, the Creation Museum is a $27 million extravaganza of misinformation. Dinosaurs walk with humans, Noah’s flood gouges out the Grand Canyon, and Earth celebrates its 6000th birthday! And all of the above is demonstrated, not with carbon-dating systems or peer-reviewed scientific papers or any logic at all, but with Universal Studio designed robots! “Keep God small enough for us to understand him” seems to be the unspoken motivation behind such a glitzy presentation of the book of Genesis. Just look at the representation of Adam and Eve for starters- they are nothing more than a projection of what the owners of the Creation Museum want them to be- they look like us! (“Us” being the primary potential visitors to the Museum: Caucasian, evangelical, middle-class citizens of the United States.) There is not a scintilla of evidence, in Genesis or in paleontology labs anywhere in the world, that our earliest ancestors would have been as tall as us, or that their frontal lobes would have been as fully developed as ours, or that they would be white, or- perhaps most especially- that they would have had their hair fixed. This silly representation is “us” as we want God to have made us! This whole Creation Museum is but an outward and visible blister, a tiny symptom of a disease which is threatening- I believe- to turn our faith and understanding of God into a static and stagnant set of rules which more and more people will eventually abandon. The anti-scientists (and that’s what they are, despite their hollow protestations to the contrary) believe that God can be fully known, is fully known, through the literal words of the Bible. If it says in Genesis 1 that God made day and night before God made the Sun, then that’s how it is, according to the literalists. Their quest then becomes not a mission to discover anything new about God, but to bend the evidence found by others into their own, small rock- hewn boundaries of knowledge. If Genesis had been the literal truth about God- all humans ever needed to know about God, about each other, about the world, the universe, tools, agriculture, medicine, and urbanization- then there would have been no need for the prophets, John the Baptist, or even Jesus! All that would have been needed was a panel of “sacred” arbiters combing the words for their legalistic meaning (in Hebrew! ), and then getting the people to obey and act on those meanings, backed by a system of police and penalties for any disobedience. I’m one who is utterly and completely comfortable following Jesus into the world where new knowledge is unfolding and being revealed all the time. I feel no need whatsoever to build a fortress around any of my knowledge, and I certainly have no desire to build animatronic projections of my limited knowledge about anything in order to make you believe me. So, no, The Creation Museum is not on my summer itinerary. 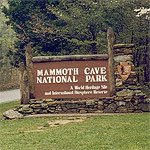 But if you are up that way, Mammoth Cave is in central Kentucky. 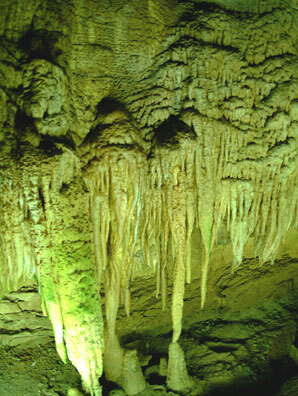 It’s the world’s longest cave, and you can see stalactites that are..well, over 6000 years old! I really enjoy your thoughts integrated with technology that allows me to hear and view complementary ideas. Glad to have you back. Lindie and I missed your First Mornings. Maybe not specific evidence as such, but IMHO I think it more likely that their brains were possibly far MORE highly evolved than currently – primarily because sin corrupts and changes everything. While we’ve no true knowledge of what they knew, they were certainly privy to a lot more before the Fall than afterwards, and I think if you look at how civilisation was in Noah’s day it was obviously extremely advanced for the time, as God determined they were getting “too big for their boots” in too many ways hence the Flood. Again, I think you only have to look back even to the time of the Pyramids to recognise that man may not be at the peak of his brain capacity, but perhaps lower, as few yet can truly figure out how the pyramids were achieved in their design. Ha Tikvah, you are one of the legion of bible lovers that have clearly never read the bible. The tales of Lot are just barking mad. You have the audacity to claim that the child killing, female stoning, genocidal fantasists of the time were more avanced than we. They had no medical knowledge and put illness down to sins or demons. Both versions of the bible, by that I mean the insane one and then the re-made up version written by the men of the time, are nonsense.